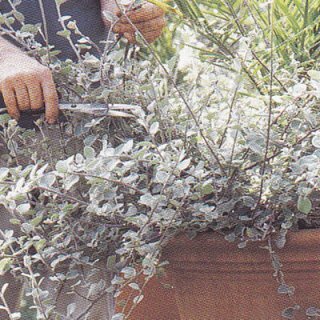 Most plants benefit from some sort of regular pruning and maintenance. The trick is in know when to prune what. A great many flowering and fruiting plants prefer to be pruned while they are dormant, in late winter through early spring. Some, like spring blooming trees and shrubs, will start setting new buds as soon as the old buds have fallen. These will need to be pruned shortly after flowering or you risk pruning off the new buds with the old. And still other plants need to be continually pruned and deadheaded to remain vigorous and in flower. Perhaps the most confusing group of plants, when it comes to pruning times, is flowering trees and shrubs. A general rule of thumb is to prune summer and autumn flowering trees and shrubs in the dormant season (late winter / early spring) and to prune spring flowering trees and shrubs soon after their flowers fade. The confusion comes with plants like hydrangeas, roses and clematis; some of these flower in spring, some in summer or autumn, some flower repeatedly. Any major pruning should be done just after a plant finishes flowering, or just before a new growth period to direct the plant's energy into strong, healthy shoots and abundant blooms. All dead or straggly stems should be cut first along with any suckers (shoots growing from the rootstock). Stems growing inward toward the centre of the plant should also be cut to allow air and light into the plant's center. Use sharp shears to make strong, clean cuts without ragged edges. When pruning, cut off the branch as close to (flush with) the main stem as possible. Partial stems should be cut about a half a centimetre above a bud at an angle, to let any moisture drain away. A perpendicular cut may cause the stem to die back. If you create the ideal conditions for your planter-grown plants it can lead to exceptional growth which needs to be trained in the right direction or pruned back. 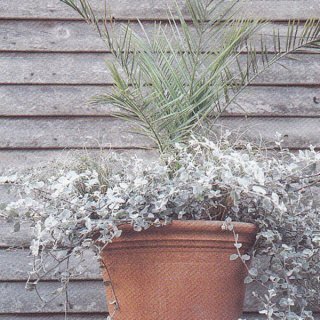 This Helichrysum petiolare threatens to engulf the palm in the centre and because the effectiveness of the planting relies on a balance between the two, it is being trimmed back and removing its yellow flowers, which are not desired. The aim when reshaping a planting is to remove enough growth to restore a balance to the design but in such a way that it appears as if little has been altered. To achieve this, cut back stems to a side shoot or take out whole shoots completely. When cutting back thick shoots, cut the stem at a downward angle to hide the cut ends as these often turn white and look unattractive.